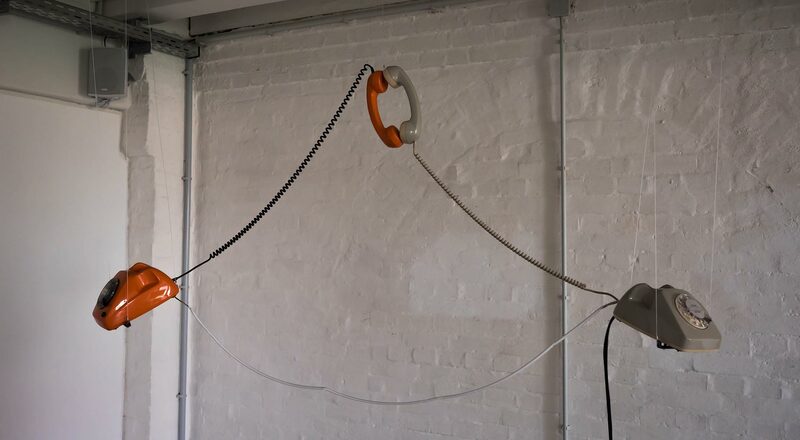 This is an installation which generates feedback noise by connecting two telephone's receivers. From one receiver it sounds “hello?” and this sound is directly recorded by the other receiver in a digital way, then plays it. And this process loops infinitely as the picture shows below. 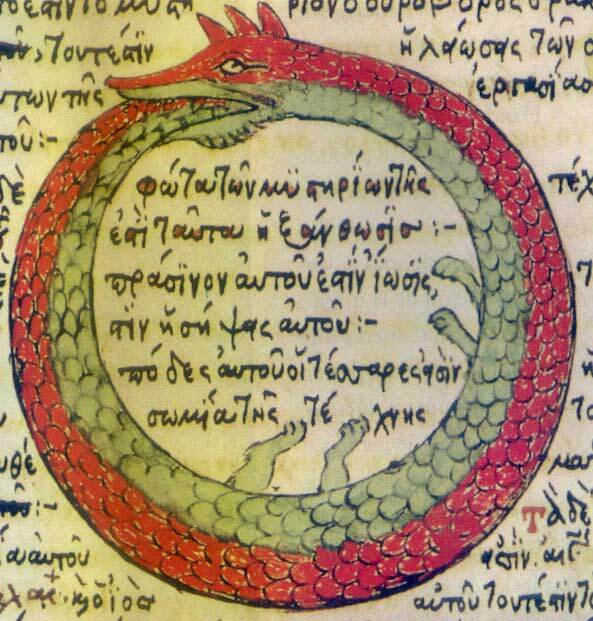 The receivers are set to form the feedback like the image of Ouroboros which tries to eat its own tail. “tele“ and “phone” are derived from Ancient Greek, and it means respectively “distant, far off, or afar” and “sound, voice”. The smartphone which we use today has much more functionalities compared to the original meaning of "telephone" though, the telephones in this installation ( They are German telephones called FeTAp611-2 and FeTAp612-2 and mostly used from the 1960s until the 1980s ), although it’s not so distant past, only played a role to connect the voice between two distant places. Since the telephone was practicalized in the late 19th century, it has been used all around the world as a communication tool. For the military purpose, in the private enterprises, in the family and for individuals, it has made the phonetic communication possible between remote places and gets rid of the time cost which the mail-service must have. However aside from the practical aspect, in films, the fictional world, it has frequently the symbolic function ( Movie Phone Super Call ). For example, in Matrix ( 1999 ), the telephone plays a role as a mediation between the real world and the fake world, In "Dial M for murder“ ( 1954 ) directed by Alfred Hitchcock, it connects death with life, in “Scream” ( 1966 ), it connects ghoul with innocent girl, in the old TV series of Batman ( 1966 ), the telephone called Batphone connects superhero with normal citizen. 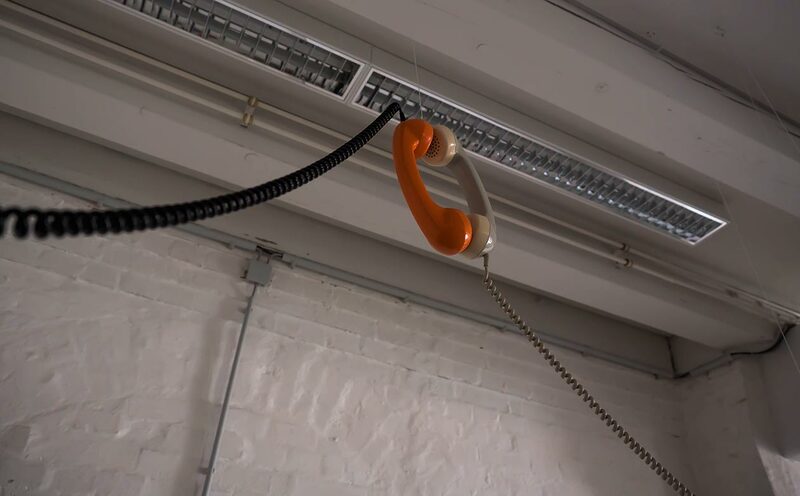 The telephone is endowed with the symbolic image which calls transcend world as a metaphor in a way. 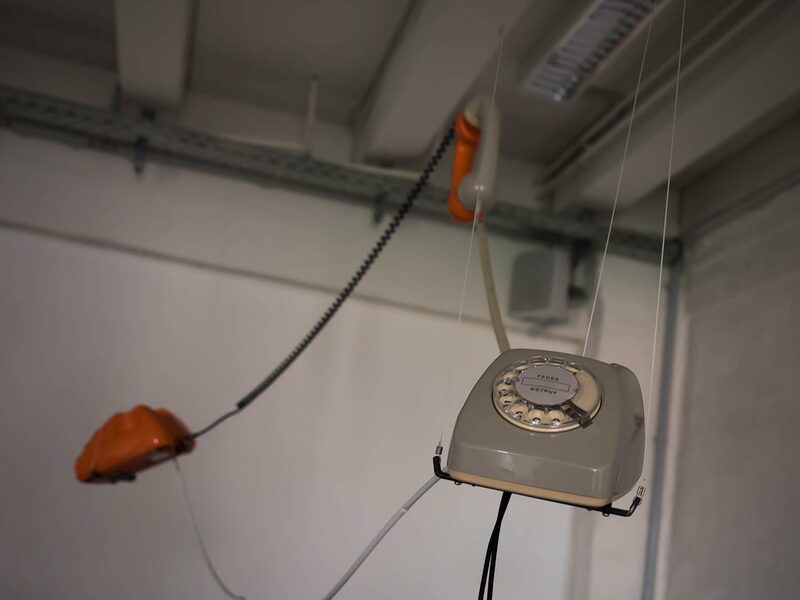 It is not surprising that it has such a symbolism since the telephone was the first tool to connect totally distant two worlds in real-time. The question “Hello?” during holding the telephone is the word which confirms the existence of the person on the other side. 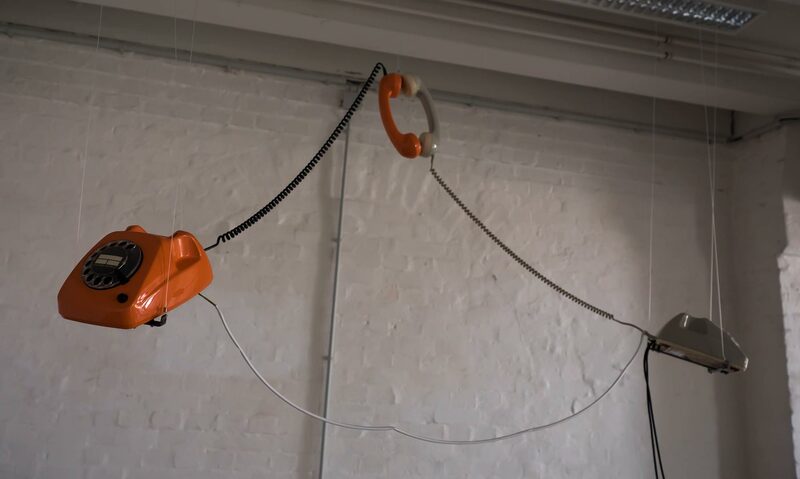 But in this installation, as these telephones are directly connected without humans, what it’s happening here is that the voice which doesn’t exist physically, confirm the existence which doesn’t exist. This absurdity can evoke the relationship between God who keeps silent in the transcend world and the religious person who calls it in this world and its fruitless continuity. The communication tool has rapidly developed specifically in these hundred years so that people forget the time- and spatial- distance between humans. Its variation becomes quite diverse and also its devices are being produced on a large scale. But if people make so many things automated and mistakenly humans themselves are alienated in this communication's circle, what kind of scene we would see?